Canon CR2 Codec for Windows 8.x Desktop, Windows 7, Windows Vista and Windows XP (all editions including 64-bit) - Adds first class Canon CR2 files support to Windows Explorer, with full metadata exposed! 64-bit and-32 bit Canon CR2 raw codec for Windows 7, Windows Vista and Windows XP SP3. Enables support for Canon CR2 and CRW raw formats in Windows Explorer, Windows Photo Gallery, Windows Photo Viewer, Windows Live™ Photo Gallery and, on Windows 7, also within Windows Media Center and Media Player 12, with full 64-bit support. 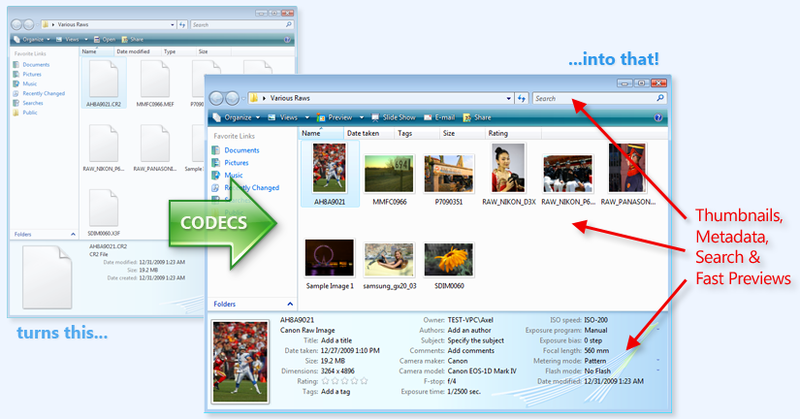 Genuine codecs go beyond simple "thumbnail providers" and enable the full end-user experience, with full-size viewing in built-in image viewers, Windows Photo Viewer slideshows, Explorer metadata display and Windows Search integration. Our Canon CR2 codec supports raw files created by Canon digital cameras in RAW or sRAW modes, providing excellent previewing performance and high-quality thumbnails. The codec also supports the CRW formats and exposes color profile data to compatible applications, enabling color-managed previewing of CR2 files shot with the camera set to the Adobe RGB color space. The codec also supports files created with the original EOS 1D and EOS 1Ds digital cameras, with .TIF extension. Our product is always up-to-date and supports all latest Canon camera models. The codec can be configured to use the embedded preview JPEG, instead of performing full raw conversions, using the supplied Control Panel applet, making CR2 previewing extremely fast, comparable to normal JPEG viewing. Uncheck this option to enable full-resolution decoding from the raw data. A separate codec supporting modified Canon compact camera models with "hacked firmware", known as CHKD, is also supplied (although not installed by default). Integration with Windows Search let Windows Vista and Windows 7 users locate CR2 files instantly from any Explorer search box: find files on Title, Author, Keywords/Tags etc. directly within Windows Explorer! Additionally, our bundled JPEG decoder improves JPEG viewing speed on by up to 30% on Windows 7 and provides auto-rotation of JPEG files in Windows Explorer, Windows Photo Viewer and Windows Media Center 7 and Media Player 12. Get the FastPictureViewer Codec Pack! Download link provided automatically by email after license purchase. Please see our main product page for a full description of the FastPictureViewer Codec Pack, with detailed installation instructions, screenshots and a list of all supported image formats and camera models, or download our free, fully functional 15-days Trial Edition. Find us on Microsoft BizSpark Connect, the Microsoft Partner Directory and in the Software Industry Professionals directory. Axel Rietschin Software Developments is a Software Industry Professionals member.